Broken, Shattered & Exploding Oven Door Glass Survey and Report. Some background information about this report and the authors. OVENU is the largest global franchised network of domestic oven cleaning, oven detailing and oven valeting professionals. Operating successfully since 1994, our network currently undertakes over 50,000 jobs a year in the UK alone for domestic clients, schools, property management professionals & smaller semi-commercial premises. iii) to ascertain exactly how prevalent (or not) the phenomena of shattering or exploding oven door glass actually is. We also aim to give some ideas and insights as to why some oven door glass shatters, or, as it has been described by those unfortunate enough to have witnessed it, in their own words, “exploded”. Our survey was carried out towards the end of May 2013 and the results gathered are from 97 OVENU franchisee respondents from across the UK, including the Channel Islands, therefore there was no geographical bias. a) In your time as an OVENU franchisee, how many jobs have you completed? b) And, in the same timeframe, how many oven door glasses have broken whilst you were working on the appliance? c) Of the above, how many of these were undoubtedly your responsibility? The answer to a) above… The total number of jobs that have been undertaken by those 97 who responded to the survey was 295,334. On average, those who responded have been an OVENU franchisee for six and a half years. Many have traded successfully for over 10 years. Therefore, if we divide the total number of jobs done by the length of time as a franchisee, this shows that, on average, there were 45,436 jobs completed every year. 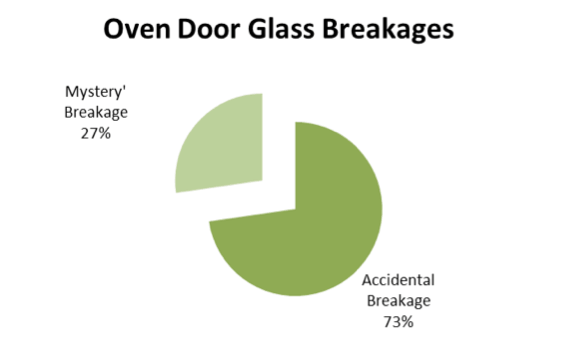 In answering b)… there were a total of 209 incidents where an oven door glass was broken. As a percentage, this is a reasonably tiny 0.07%. 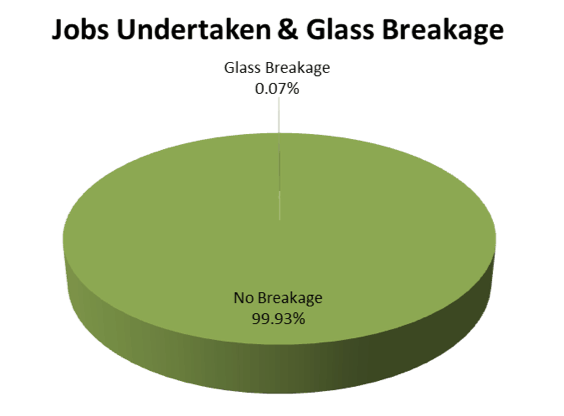 Put another way just 7 breakages for every 10,000 jobs undertaken…..or one every 1,428 jobs … that’s just less than 32 a year out of an average of 45,436 completed jobs. Leading on to the answer to c)… 152 breakages of the 209 total were accidentally caused by the franchisees. Again, as a percentage, this works out to be just over 72% of all the instances where a breakage occurred. This leaves just 57 instances out of 295,334 completed jobs where oven door glass shattered for no apparent reason. This figure is just under 9 cases a year. As a percentage, the 57 ‘mystery’ cases represent just 0.02% … again, put in a slightly different way, a solitary ONE instance per 5,000 jobs undertaken. An aside to the main survey subsequently revealed that 33 calls had been received by franchisees from clients reporting instances of ‘exploding’ oven door glass a while after the cleaning work had been undertaken. These reports were received days, weeks and, on the odd occasion, months afterwards. Although this only represents just one call per 10,000 jobs completed, we feel that it is worthy of a mention. Although tempered oven door glass is a very strong, tough & durable material, it would appear that some accidental breakages occur periodically despite every precaution being taken to prevent them at all material times. And, although always regrettable and probably best described as ‘inconvenient’ at worst, it is widely accepted that accidents do happen but, as the survey shows, the accidental damage rate is extremely low. The franchisees aren’t always accountable for accidental breakages … some have reported cases where pets in the kitchen have knocked over glass door glass and, in one specific case, the client asked the franchisee how long it would be until he’d finished the job whilst actually standing on the oven door which had been removed for valeting in between the glass panes! Luckily in this instance the door glass withstood the client’s weight so no harm done. An important consideration is that, when accidental breakages do occur and there are no liability issues, remedial action is instigated quickly and efficiently by all of those concerned and replacement panes are ordered with the minimum inconvenience to clients. As we’ve already mentioned within this report, here’s a phenomena that can be extremely upsetting and even frightening for those who have witnessed it first-hand. Oven door glass that seems to ‘explode’ into thousands of tiny pieces for what appears to be no apparent reason. And when tempered oven door glass shatters it can fly all over the kitchen and even end up covering meals that are cooking inside the oven if it is the inner glass that fails. On the face of it these ‘explosions’ happen for no reason, sometimes when the oven or cooker isn’t even being used or nobody is at home. Very peculiar indeed but do these oven door glasses just shatter for no reason at all? The answer to this question is a definite ‘no’. You’ll note that the word ‘fail’ has been used above and there is good reason for this. One of the apparent reasons that oven door glasses can explode is a minute flaw that is an inherent consequence of the manufacturing process. When sheet glass is being rolled into the correct thickness using stainless-steel rollers, tiny (not visible with the naked eye) microscopic particles of stainless-steel containing nickel are pressed into the glass. Now, strange as it sounds, these tiny particles can ‘grow’ over a period of time and it is this ‘growth’ that changes the internal stress on the tempered glass causing it to suffer a ‘stress-fracture’ or, as we’re describing it here, an explosion. The expression of ‘explosion’ being that which is typically used by home-owners who have witnessed this unfortunate experience … glass breaking with a loud bang. Stress fractures can be caused almost inadvertently. Just a small, accidental tap against an oven shelf whilst closing the oven door or even a tiny scratch caused by a ‘foreign body’ in a cleaning cloth can cause tempered glass to shatter. Even a shopping bag full of groceries brushing an oven door; seems innocent enough at the time but may well be the catalyst creating catastrophe. Tempered oven door glass is a very resilient material by design but even what seems to be the most innocuous knock can have disastrous consequences. What is extremely surprising however is that the glass may not shatter there and then. It can take a while to break from having been knocked or scratched. Hours, days or even weeks may go by before the change in stress levels alters to the point where the glass fails. In many reported instances the oven may well not be in use leaving homeowners somewhat bewildered as to what has happened! A little more about tempered glass … to hopefully shed a little more light onto the subject. When a sheet of regular glass is ‘tempered’ it is heated to a very high temperature, (around 620 degrees Celsius is the industry ‘norm’), for a short period of time and then cooled very quickly, a process known as ‘quenching’ within the industry, and it is this process of heating and cooling which alters both the strength and the stress levels within the glass. As the glass is being heated it almost becomes ‘relaxed’ but, as jets of cold air are blasted from various different angles, the surfaces quickly become ‘taut’ or tightened. The reaction of the glass is very similar to how a human would react if he or she was sun-bathing in a pleasant, warm & relaxed environment and was suddenly covered in ice cold water! Once the glass has been tempered it becomes significantly tougher and it has the ability to withstand subsequent heating and cooling but the stress levels on and near the surfaces of the glass are different to those towards the centre of the pane. Anything that alters the stress level on the taut surface may well cause the glass to shatter. But this doesn’t necessarily just apply to the large, flat surfaces of tempered glass. 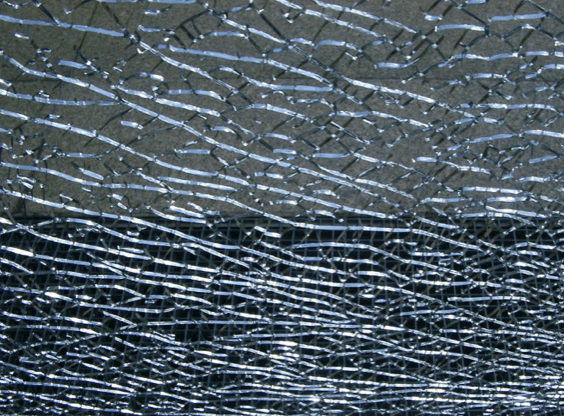 The same effect of the glass ‘exploding’ can be caused very easily if the polished edges are tapped or inadvertently knocked. Simply removing an oven door glass for cleaning and standing it on a tiled or stone kitchen floor for example, can have devastating effects. Likewise, when replacing a slide-in oven door glass after cleaning, even the slightest tap on an edge can cause the whole pane to shatter. And, as improbable as this might initially appear, opening the oven door with more pressure on one side than the other (causing it to twist ever so slightly) can cause a stress fracture. Even the most seemingly bizarre thing such as hanging a cold or damp tea-towel over an oven door handle could cause the glass to fail as the surface temperature becomes uneven between the covered and the uncovered area. It would be extremely remiss to exclude the cleaning of oven door glass in this report especially as many proprietary products suggest within the ‘Warning’ section, typically on caustic-soda based aerosol products, that ‘polished surfaces’ are unsuitable for application. Our understanding of ‘polished surfaces’ is that it is glass which is being referred to. Caustic soda, or sodium hydroxide as it is known, is corrosive by nature and can ‘etch’ glass. What isn’t quite so well- known however is that it becomes more ‘aggressive’ when heated so that even the smallest amount of residue within a scratch on the surface of a pane of tempered glass could quickly alter the stress levels underneath the tempered layer and cause a breakage. That’s assuming that the scratch doesn’t cause the glass to explode in the first place! Many ‘off-the-shelf’ oven cleaning products contain caustic soda in some guise or another so it’s well worth reading the ‘contents’ well before applying to glass as any adverse effects are generally irreversible. So that’s our survey and report. We trust that you’ve found it helpful and informative. Other instances of ‘exploding’ glass. There will inevitably be questions asked in due course as to the suitability of tempered glass being used in all of the applications mentioned. No doubt the issue referred to as ‘fit for purpose’ will be raised. As these are matters that really should be reserved for manufacturers and insurers, it’s probably prudent for us as domestic oven cleaning specialists to ‘side-step’ these matters… for now.